The Solar Living Institute was created in in 1998 by the founder of the Real Goods Trading Company, John Schaeffer. This non-profit solar training organization promotes sustainable living through inspirational environmental education. 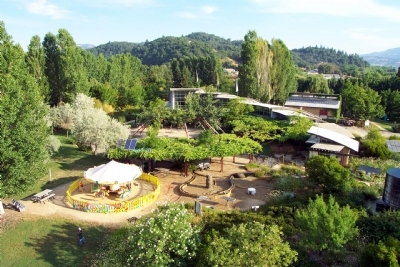 In 1998, the Institute opened the Solar Living Center, a 12-acre renewable energy and sustainable living demonstration site that is visited by 200,000 people annually. The Institute has a workshop program that offers intensive lectures and hands-on training in energy efficiency, solar photovoltaics, wind and hydro systems, passive solar design, water development, gardening and composting. The program began with workshops first offered by Real Goods in 1991 under the name of the Institute for Independent Living. In September 2003, Yokayo Biofuels in Ukiah, CA donated a biodiesel fueling station to the Institute. Citizens with diesel engines equipped to run on biodiesel can drop by to fuel up 7 days a week. In May 2003, the Institute also became home to a 4,400 square foot organic farm, which provides a model for learning how to integrate energy efficiency and sustainability into a synergistic, regenerative system of food, water, shelter, and landscape. Businesses donate manure and seeds, a solar pump irrigates the farm, and proceeds from seasonal produce sold at a farm stand on site help to feed interns. Interns also get food from an organic, “kitchen garden” and various food-bearing plants on the site. The Institute also produces an event called SolFest, which has attracted 80,000 participants since it first began in 1996.